Inside their sleek exteriors, phones are made from dozens of minerals and metals that are extracted and assembled together in ways that might make you cringe. The materials that make our phones work can be mined from politically unstable regions with poor human rights records. Assembly lines can be unsafe for factory workers. Throwing a phone in the trash can damage the environment. Fairphone wants to reduce the number of "blood gadgets" in the market. To do that, it has designed a smartphone with some conflict-free minerals. It produces the phone in factories that commit to treating their workers fairly. And it has found a way reduce the amount of hazardous waste their phones produce when they're discarded. The Netherlands-based company has already sold 60,000 of its first generation smartphone. Fairphone's second-generation device, the Fairphone 2, will go on sale in Europe later this week. Somewhere between 30 and 40 minerals are used in the production of the Fairphone. Of those materials, gold, tin, tungsten, and tantalum tend to be mined from conflict zones. The Fairphone's tin and tantalum come from conflict-free mines in the Democratic Republic of the Congo (DRC). Tantalum, used to make capacitors in printed circuit boards, is taken from a mineral called coltan. According to Fairphone, 80% of the world's coltan supply comes from the Congo, where rebels extort money from many miners. 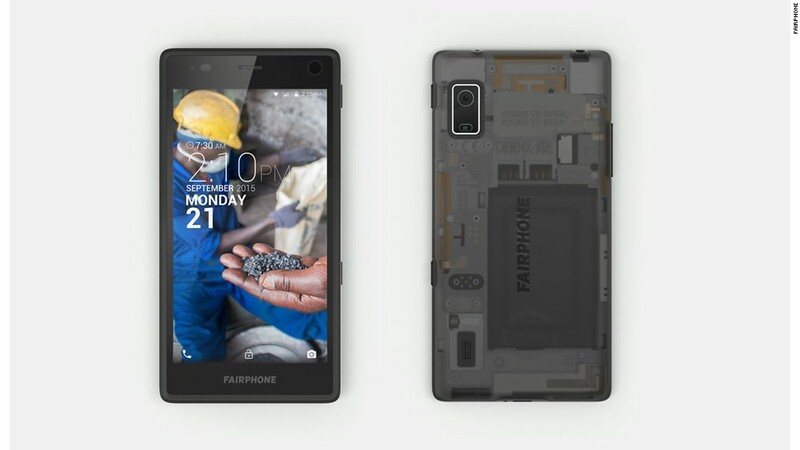 Fairphone says it works with Solutions for Hope to obtain conflict-free tantalum. Fairphone says it's working to source gold and tungsten from more responsible mines now. "Making a really fair phone is, we believe, impossible because fairness means different things to everyone," Fairphone's Daria Koreniushkina told CNNMoney. "The supply chain is very complex. It's not a 100% fair phone...But we can always make fairer and fairer and fairer products, so we'd love to compete with others on the fairness of the phone." 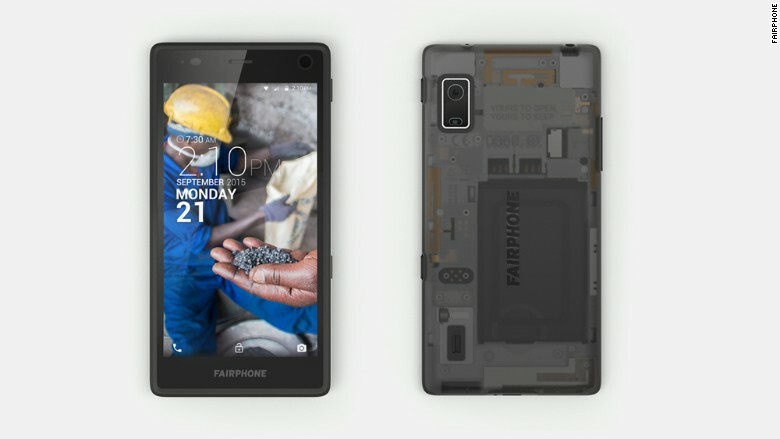 Fairphone says its production factories must ensure they provide quality manufacturing, fair wages, safe working conditions, and the ability for workers to unionize. The company also created a special bonus pool for some of its supply chain workers, which are tied to the number of smartphones produced and sold. For each sale of its first device, Fairphone added $2.50 to the fund, which the factory matched dollar for dollar. 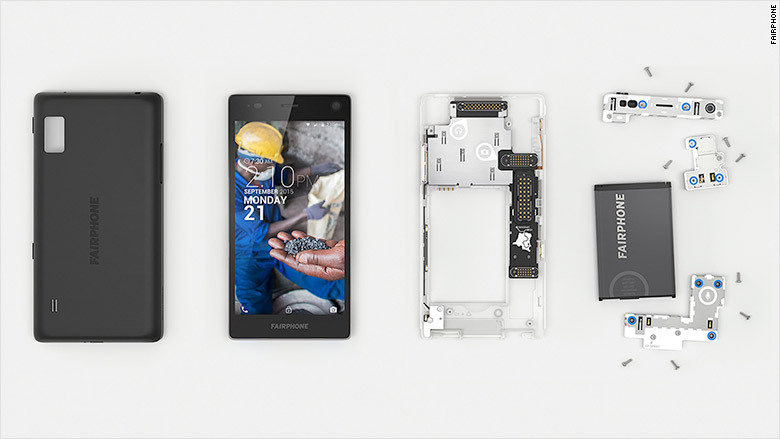 When possible, Fairphone incorporates recycled materials and plastics in its parts. The company contributes money from sales to support programs that properly dispose of e-waste. It also partners with nonprofits such as Closing the Loop, which provides unwanted used phones to people in Africa and Asia. The Fairphone 2 is modular, which means you can take easily it apart and fix it. In the future, you may be able to upgrade memory and other components to extend its life. Fairphone hopes this will help people keep their phones for longer, reducing the amount of e-waste that enters landfills. The phone has medium-range specs comparable to last year's Moto X. It costs €525, including tax (about $575).